One of the perks of my job is people sending me fabric to play with. It all seems well and good and lovely (and it is) but if I don't play with it in a timely manner I feel guilty and awful. The whole point to sending the fabric is to promote it. And, I must confess, there are times that the fabric sits in my stash, untouched, for a very long time. I never even photograph it. And that means I've wasted the designer's time and money to send me the fabric. This makes me a tool. As a result, I've become very honest and selective when contacted about fabric. I know how I like to quilt and create. Single line quilts just aren't my thing generally. And being able to stop everything I'm doing and play with a specific fabric is a near impossibility. So, yes, I will happily take any fabric you want to send my way, but if you expect me to create with it right away it might be best to find another designer or blogger. Sometimes they are still willing to send you the fabric. And when you get it the bundle is so lovely and inspiring that you do start creating right away. Well, within a month of receiving the fabric at least. For me, that is right away. 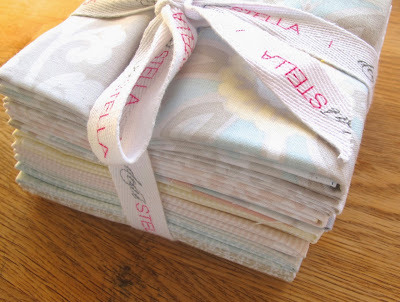 The bundle up there arrived on my doorstep from Dear Stella just before Quilt Market. They contacted me and asked if I would like to play with one of their upcoming lines. You know me, I had to pick the one that whispered. (This, despite the fact they made two awesome quilts from Sunday Morning Quilts with Mini Confetti Dots and Zig Zags.) Very soft, very pretty, this Vanity Fair line. In all honesty, the bundle was set to linger on the shelf, then likely broken apart as inspiration hit. Then I remembered a magazine contribution coming up, rescued an orphan block of something I was testing for my Craftsy class, and found the Vanity Fair some friends in my stash. Commence play. Such soft gentle looking colors. I look forward to seeing what you make with them. ooh! Seriously nice fabric. Not familiar with this so I'm off to check it out! I love the look of Dear Stella, so pretty! If it was snowing, I would choose hot chocolate but my daily beverage of choice for relaxation is a big pot of tea. 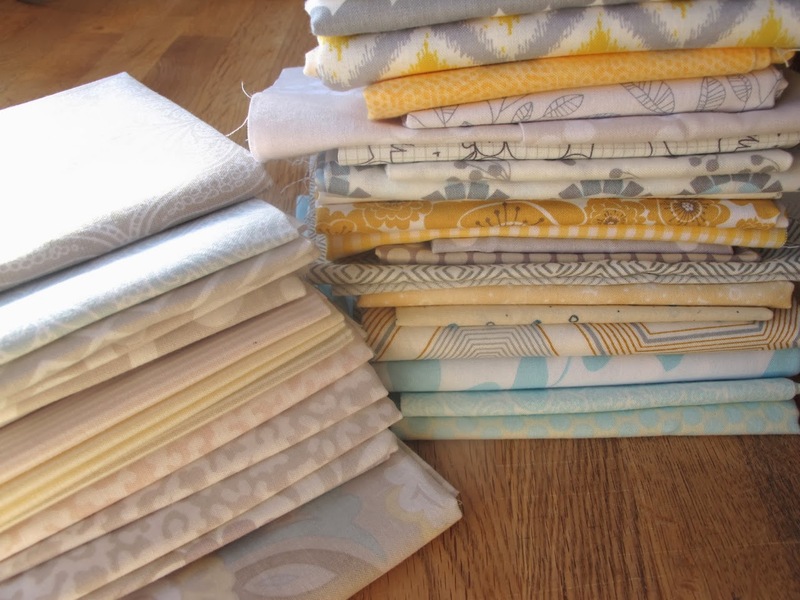 Luv the collection of low volume fabrics ... and both of your books!